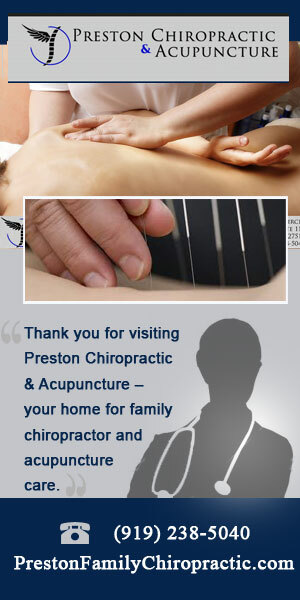 Preston Chiropractic and Acupuncture – find us in Cary NC! How CAN our chiros help you? Most people think of chiropractic treatments as the stereotypical whiplash treatment doctors. And yes, we are those people. We’re not the ambulance chasers though that so many people equate with that kind of patient. Those kinds of injuries DO respond well to treatment and we DO a lot of whiplash treatments, accident treatments in general, and the like. That’s NOT our biggest patient group though. Things like ongoing back pain drive a far larger number of patients into our Cary NC practice. There’s a whole lot of customers however that many people don’t even associate with chiro treatments! There are so many people that experience serious sleep disorders and headaches, and chiropractic medicine such as spinal manipulations have been used to successfully treat them. A spinal manipulation can get the natural mechanical arrangement of the spine back in order which, when out of alignment can cause problems with the flow of your nerves. More illnesses chiropractic medicine can work wonders with include allergy symptoms, ADHD or attention deficit hyperactivity disorder, and symptoms of asthma. Even though there are many loyal and qualified chiropractors, you should take the same steps as you would for researching any kinds of physicians when looking for one. You should go out of your way to research a new chiropractor and meet with him to talk about your illnesses. Also, never be afraid to ask questions about experience, credentials, methods of treatment, and willingness to work with your family doctor. Chiropractors, to rid a patient of joint pain, may seek to manipulate or mobilize the person. Range of motion problems can affect the arms, legs, spine, neck, shoulders, and other areas. You will usually find these joint problems have to do more with the muscles and ligaments. When this happens, chiropractors will typically make use of manipulation which they’ll use on the joints and muscles in question in order to go about restoring the patient to normal. Joints that experience this are usually stuck or they have adhesions. The patient will be mobilized by having the joint and the tissues around it mobilized. However, with spinal joints the chiropractic manipulation can be more effective with pain relief and restoration of normal movement. This form of medicine has been around a long time and involves making sure the body, and all its parts, works as it should. So who do you think should go see a chiropractor? A person whose body isn’t structured properly – pure and simple. Another person who should see a chiropractor would be anyone whose joints, nerves and ligaments aren’t functioning properly. The way in which treatment is offered primarily involves what is known as the chiropractic “adjustment”. In most instances, the spine holds this joint that’s giving the patient problems, and the chiropractor will adjust the spine by preceding to rapidly thrust in and out of the spine while the patient rests on a special table. Cary, North Carolina has been the official home of Preston Chiropractic & Acupuncture and Nirvelli Day Spa for over 10 years. Located only 1.2 miles from the prestigious Prestonwood Country Club, and only 5 miles from Downtown Cary, we are indeed in the middle of it all. These are just a few of the services we offer. For any of your Cary chiropractic needs, give our offices a call. We have some of the best chiropractors in Cary and surrounding areas. Whether you were involved in an auto accident or are working hard at your cubicle, we are dedicated to help you advance in life with great posture. With a family friendly environment and cordial staff combined with quality therapy, the people of Cary have chosen us as their Cary chiropractor of choice.